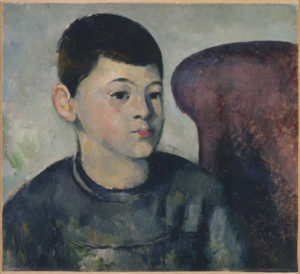 The portrait, which places the boy next to a red armchair—which should be dated in about 1883-1884, if the boy is eleven or twelve years old—is conceived not in analytic touches but in strong shapes instead: the round chair back intrudes toward the head and nearly meets it, acting as an adversary, not as a comforting background. Such an opposition, and such awkward proximity, seem to contradict the most basic assumptions about painting, but in fact they both work well. The sinuous shape of the chair back actually points to its mirror image, the distinct S of the boy’s hairline, and it is these two lines that form a unit—at a comfortable distance from each other. The chair’s push to the left also balances the turn of the head to the right, a turn that would otherwise seem a shade too pronounced. 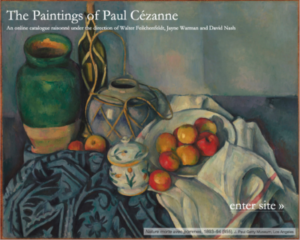 We are aware, too, that absolutely all the forms in the painting are round, and that the chair is part of the swirl of forms; the painting is unified by the consistent language of its forms.